Welcome to Monitor, the data acquisition and control newsletter. In this issue two stories of taking measurements with your computer. You can download Monitor as a pdf file from https://www.windmill.co.uk/monitor/monitor206.pdf. Researcher Parisa Sadat Abbasi Jahromi is investigating efficient recovery of pure metallic nickel from nickel waste byproducts. 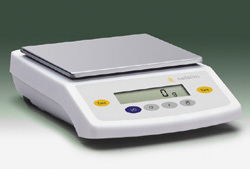 As part of her experiments she is using two balances (Sartorius Talent TE4101 scales). These she connects to a computer running Windmill software. The software records the weight on the scales every 15 seconds for the duration of each test. Jahromi used the Windmill ComDebug software to enter the balances' settings and then the Windmill Logger software to regularly collect data. Hello I am looking to get data from a digital gauge through serial to usb and into open office PC running windows 7 64-bit. Can you help? Yes. Download the Windmill software trial and free ComDebug package from https://www.windmill.co.uk/serial.html. Use ComDebug to collect data from the digital gauge and then open the data file in Open Office. You need to ensure that the settings in ComDebug and the Serial-USB converter match those being used by your digital gauge. Select Create a new Windmill Instrument File. Choose Serial and fill in your gauge's communication settings - baud rate, com port, etc. Have you ever been frustrated by Excel cluttering up your worksheet with active hyperlinks, when all you wanted was a text reference? You can easily get rid of them with a simple macro. Scientists have used a unique combination of marine robotics and ship-based measurements to produce the first true three-dimensional picture of submarine canyon habitats. The information captured in this new set of maps ranges in scale from the 200 km canyon down to the size of an individual cold-water coral polyp. Soil moisture sensors are very helpful in protecting water resources and understanding the ever-changing climate. With the demand for reduction in critical water resource, the soil moisture sensors market is expected to have a wide scope of applications in areas such as agriculture, sports turf, weather forecasting, forestry, research studies and construction. The growth of the soil moisture sensor market is driven by gradual shift in the climatic conditions, environmental regulations and improved productivity, according to a report published by Research and Markets. Scientists have created a solid-state memory technology that allows for high-density storage with a minimum incidence of computer errors.